beautystorebusiness.com | September 2016 75 NATERRA INTERNATIONAL LAUNCHES ITS FIRST BRICK-AND-MORTAR STORE, GANGNAM STYLE Coppell, Texas-based Naterra opened Naterra Korea, the company's first brick and mortar store, in upscale Cheongdam-dong, an area of the famed Gangnam District, shot into popular culture by the Korean singer, Psy. The retail space will serve as the official Korean flagship store for Naterra and the home of TIGI, the global professional cosmetics and haircare brand. Jin Song, CEO of Naterra, said, "Introducing Naterra to Korea was an essential and pivotal move for our company. 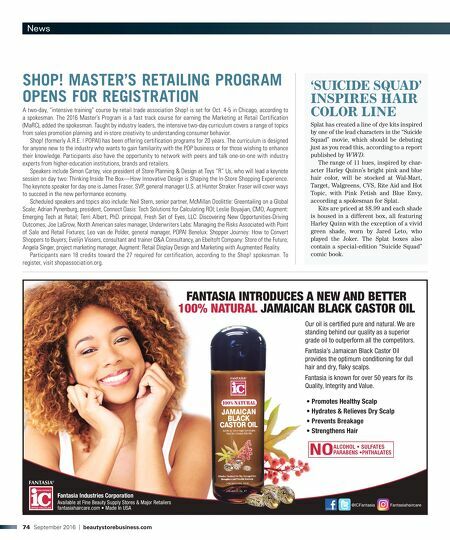 We know this market has great enthusiasm for beauty and personal care offerings." The 5,000-square-foot space will feature displays showcasing products from TIGI's haircare lines (Bedhead and S Factor) as well as TIGI Cosmet- ics. Naterra Korea will also carry additional Naterra owned personal-care brands, including botanical skincare brand Wildflowers, body and skincare brand Tree Hut and baby-care brand Baby Magic. Naterra will open a new corporate office, housed in the Naterra Korea store, which Song indicated will be used as a foothold for further expansion in Korea. 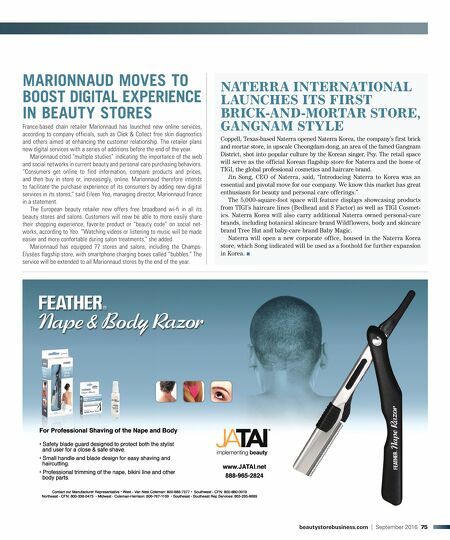 ■ MARIONNAUD MOVES TO BOOST DIGITAL EXPERIENCE IN BEAUTY STORES France-based chain retailer Marionnaud has launched new online services, according to company officials, such as Click & Collect free skin diagnostics and others aimed at enhancing the customer relationship. The retailer plans new digital services with a series of additions before the end of the year. Marionnaud cited "multiple studies" indicating the importance of the web and social networks in current beauty and personal care purchasing behaviors. "Consumers get online to find information, compare products and prices, and then buy in store or, increasingly, online. Marionnaud therefore intends to facilitate the purchase experience of its consumers by adding new digital services in its stores," said Eileen Yeo, managing director, Marionnaud France in a statement. The European beauty retailer now offers free broadband wi-fi in all its beauty stores and salons. Customers will now be able to more easily share their shopping experience, favorite product or "beauty code" on social net- works, according to Yeo. "Watching videos or listening to music will be made easier and more confortable during salon treatments," she added. Marionnaud has equipped 77 stores and salons, including the Champs- Elysées flagship store, with smartphone charging boxes called "bubbles." The service will be extended to all Marionnaud stores by the end of the year.